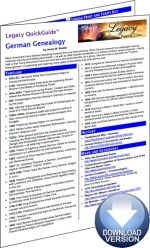 The�German Genealogy�Legacy QuickGuide™ contains useful information including a timeline of important events, terminology, migration patterns, record types and how to access those records. This handy 6-page PDF guide can be used on your computer or mobile device for anytime access. 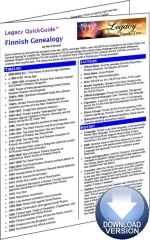 The�Finnish Genealogy�Legacy QuickGuide™ contains useful information including a timeline of important events, terminology, migration patterns, record types and how to access those records. 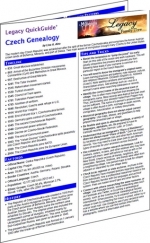 This handy 5-page PDF guide can be used on your computer or mobile device for anytime access. Lisa / Smallest Leaf’s�Hungarian Genealogy�Legacy QuickGuide™ can help you explore the lives of your Magyar ancestors. It features an overview of the history and geography of modern day Hungary and its former lands, the types and whereabouts of available records, and the languages in which they are written. 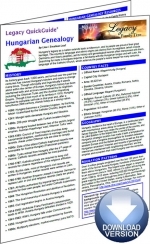 The guide provides links to many types of online resources (genealogy guides, translation tools, maps, forums and more), provides a list of publications, and offers a research strategy to follow for success in tracing your Hungarian roots. 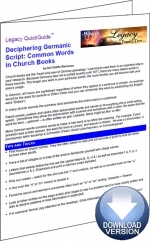 This handy 4-page PDF guide can be used on your computer or mobile device for easy access. 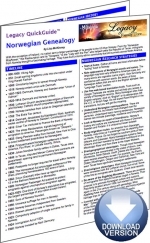 The Norwegian Genealogy Legacy QuickGuide™ contains useful information including a timeline of important events, terminology, migration patterns, record types and how to access those records. 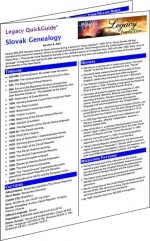 This handy 5-page PDF guide can be used on your computer or mobile device for anytime access. Looking to find those elusive Irish ancestors? The Irish Genealogy Legacy QuickGuide contains useful information including a timeline of Irish history events, tips on Irish genealogy research strategy, outline of major immigrant groups, and more. Also included are links to websites and resources covering vital records, church records, census records, as well as general Irish genealogy resources. This handy 5-page PDF guide can be used on your computer or mobile device for anytime access. 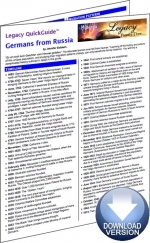 The Germans from Russia Legacy QuickGuide™ contains useful information including a timeline of important events, terminology, migration patterns, record types and how to access those records. This handy 5-page PDF guide can be used on your computer or mobile device for anytime access. Researching Slovak ancestry can be confusing especially when you don't have an understanding of the country’s history or know how to begin your research. 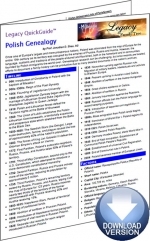 The Slovak Genealogy Legacy QuickGuide™ contains useful information to get you started including the best places to identify an immigrant ancestor’s original name and hometown, and where to find key record groups such as census, military, ship passenger and immigration records. Researching your Czech ancestors can be challenging if you don't know where or how to begin. Boundary changes, record availability, and unfamiliar languages can complicate the process. To ensure success, you will need to utilize a variety of print and online resources. 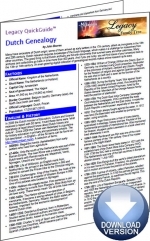 The Czech Genealogy Legacy QuickGuide contains useful information to get you started including the best places to identify an immigrant ancestor’s original name and hometown, the key North American records to search, and how to locate vital registers, land, and other documents �in the Czech Republic. Croatian research is one of the most challenging yet rewarding areas for the family historian. The historical influence of many different nations, peoples and cultures and the variety of languages found within Croatian records can test the skills of even an experienced genealogist. Yet those who persevere are often greatly rewarded: Croatia’s extensive records include some of the earliest found in Europe. 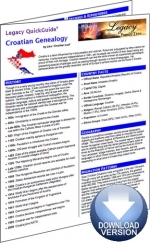 The Croatian Genealogy Legacy QuickGuide™ can help you begin to explore your Croatian heritage or assist you in delving more deeply into that search. It features an overview of the history and geography of Croatia, the types and whereabouts of available records, and the various languages in which they are written. 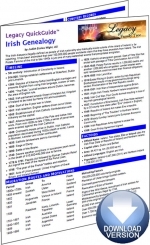 The guide provides links to many types of online resources (genealogy guides, translation tools, maps, forums and more), provides a list of publications, and offers a research strategy to follow for success in tracing your Croatian roots. 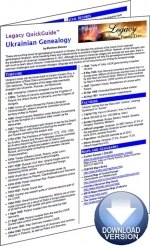 This handy 4-page PDF guide can be used on your computer or mobile device for anytime access. In this webinar, you will discover genealogy research methods for finding your ancestor's point of origin. Learn how to use tools such as maps, atlases, and gazetteers to research localities through place name changes and ever-shifting political and geographical boundaries. 1 hour and 3 minute and 6 pages of handouts. The recording is also included as part of the�monthly�or�annual�membership. For decades accessing information about Polish, Czech, Slovak, Russian, Ukrainian or other�Eastern European ethnic groups was often difficult and expensive, but digitizing efforts have�changed the research landscape. Learn which Eastern European archives and other organizations�have online records and how to access them from the comfort of home. 1 hour and 1 minute and 5 pages of handouts. The recording is also included as part of the�monthly�or�annual�membership. Are you lost trying to find your Eastern European ancestors? Do perplexing surnames, confusing geography and records written in unfamiliar languages challenge you at every turn? Learn three key skills to overcome your research roadblocks. 1 hour, plus 10 pages of handouts. The recording is also included as part of the�monthly�or�annual�membership.